We love to go on walks! It's a good thing that we live close to a lot so we have many options when we decide to go on an adventure. Today I had plans to do many things, shopping being number one on the list. I needed to get a slipcover for our couch and a few other things but God had other plans. When it was time to go I couldn't find me keys...I looked everywhere and couldn't find them. I could decide to be mad or I could decide to make another plan. I opted for plan #2. It was almost lunch time so I decided to take a walking adventure. Our first stop would be McDonald's. An immediate favorite stop! We got lunch and took our time, as we knew that Nate wasn't going to be home for a few hours. After that we left for the store. I had to take a video back to the red box and the girls love to make the transactions. While we were there we had to get another movie for the girls - I thought they could take their rest time while watching it (and hopefully fall asleep!). We picked up Mickey Mouse Club House. Who doesn't love Mickey! While we were at Kroger, we decided to browse, since we had time. The Kroger by our house has a nice OSU "store". 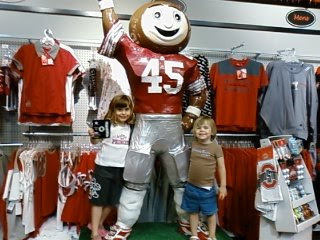 The girls ran into a big Brutus that instantly became a hit! After that, we headed over to the new thrift store to check for any goodies. We ended up with a beach ball, a skirt and a pie dish for me. I collect Royal China ceramic pie plates from the Country Harvest collection and I was delighted that they had one that I don't have yet! It was the green apple pie plate. I have the red one but I don't have the green one! I was in heaven!! I couldn't believe my treasure! It was only $1.99!! 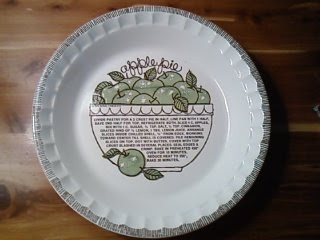 Once I got it home, my aunt called to tell me that she was at a thrift store on Morse Rd and found me a blueberry pie plate from the Country Harvest collection! Two in one day! She didn't know I had got green apple today so it was kind of a funny thing. Looks like I'll be making lots of green apple and blueberry pies! Long story short, I think I'm gonna have to go on more walking adventures to the thrift store! 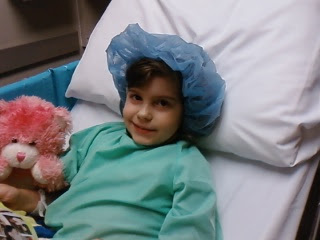 Aiva got tubes today...it was a very emotional morning but we made it. No, actually it was pretty noneventful! I was very surprised how smoothly it went. I wasn't sure what to expect but a friend of mine has a son who also got tubes this week and she filled me in on details. Thanks Mandy! 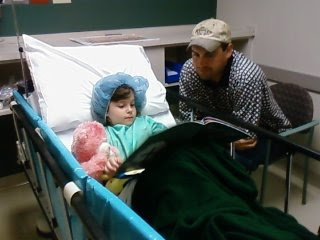 Than ks to all who prayed for my little girl. Even though this is a pretty regular procedure it was a great comfort to know how many people were pulling for us! Here are some pics of our experience! 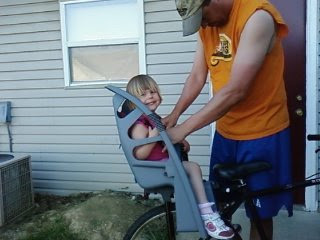 Yesterday Nate got Ana a seat for the back of his bike. She was a little apprehensive at first when she saw it so I was really wondering how she would do. Today they went to the beach and I thought for sure they would be exhausted but Nate was ready to give this new seat a try. She was not very happy at first but she eased into the seat...until it started going. I walked with her and Nate the first 50 years or so til she saw she was fine. After that she was asking to go faster! She is such a daredevil! Now that summer is here I won't be able to get them away from the beach or off the bike! Beach….just say that word a few times and what does it bring to mind? Warm sand between your toes…cool breeze…splashing waves? We’re going to the beach in August and we can’t wait! It will be the first time for both girls so I think I’m more excited to see their reaction than anything. Nate and I though that instead of springing it on them all at once that we’d gradually talk about it. Unfortunately we spoke too soon! The minute they heard the word “BEACH” they were ready to go! They’ve wanted to get sand pails and shovels for a few weeks now and that’s all they talk about. They even fought one day b/c Ana wanted to bring Aiva’s umbrella and Aiva insisted that it wouldn’t fit all of us under it. It lead to a knock down drag out fight but rest easy…all was solved when I mentioned not going to the beach. Lips were closed and they minded their momma! It was Nate’s idea yesterday that he would take them to Alum Creek Beach so they tested it out yesterday and needless to say…they both came back WET! Nate took them back today with bathing suits this time! I joined them for lunch and we had a ball. Seeing them out in their little bathing suit soaking up the sun and splashing in the water was sort of surreal. Something out of an old photograph or something. I had a “flash ahead” of me looking at a picture of them and it forced me to capture the memory and hold it for all time. If only I could stay a bit more and relish the sight. Time goes way too quick…enjoy it while you can! So I know I've taken a very long and extended break from my Attitude of Gratitude posts. It's not that I don't have a grateful attitude. It's just that life has been so dag on crazy and full. Nothing unusual or out of the ordinary. Here are a list of some that come to mind not in any particular order. 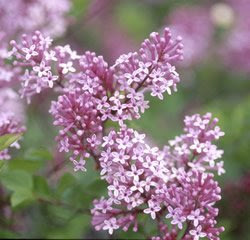 1) I have a beautiful bouquet of lilac's sitting on my desk. The aroma is to die for...these are probably my favorite flower. They almost make me punch drunk. I can't help but have a good day when the smell is lingering! 2) We celebrated my mom's birthday on Monday and my cousin was there. He's come such a long way and I'm so proud of his accomplishments. We had a good talk about the book "The Shack". 3) I cut Aiva's bangs last night and she looks like a little princess. You can see her eyes and she just takes my breath away. 4) I was able to get caught up on a lot of things today at work. It must be the lilac's! 5) This diaper cake that I'm doing for a shower this Saturday is amazing. I put all three layers together and decorated it and I was amazed. Did I do that??!! I'll post pics soon! 6) This past weekend I got the house clean and I was able to scrub the bottom of the bathtub and now it's white...yes, I'm not frustrated free! I took them all out of the bathtub. I might have to remember that next time I'm mad! 7) I'm looking forward and very grateful for a three day weekend. Makes this week not so long for some reason! 8) I received two Kraft cookbooks in the mail yesterday and I'm in heaven! The recipes inside are great and very easy too! The subscription was well worth it. The books used to be free and now they're changing you for them It's only like $8 for the year but very well worth the $$! 9) Nate went out and got a little seat for Ana to ride on the back of his bike. I think they're going to be more mobile now that everyone has wheels! Watch out Sunbury! 10) The weather is getting nicer! I've been waiting for this not only for me and my spirits but also for Nate. He's been so stir crazy that it's hard for him to sit still. He can finally go outside and be on the move. Does this mean that things won't get done around the house?? Point to ponder later!! 11) Did I mention the lilac's? Oh yeah...I'm still drunk! Go get your own!! They're amazing! This past weekend was tough....I feel like I have to take a deep breath after saying that - or take a nap - or just sit for awhile! Now that the weather is nice and it is grass cutting season Nate likes to be very mobile. He likes to cut any and all yards he can. It was going to start out like any other weekend we've had recently with not many things to do. I've loved having these weekends because I feel like we're always rushing and I LOVE to just be once in awhile. Anyway, he saw that it was going to be a nice day on Friday so he said that he was going to cut grass for his uncle on Friday so he wouldn't have to do it on Saturday. That project plus a few others ended up taking the whole weekend. Needless to say, we ended up not having a relaxing weekend. The girls love to fight so they enjoyed doing that while I pulled my hair out. Oh, and did I mention that the dog next door loves to bark day and night. I ended up having to leave to catch a breath...and then a put a note on my neighbors door to keep their dog quiet. OK...that's enough nagging. I normally don't like to do this on my blog so this is rare stay tuned for the next Attitude of Gratitude update! Have a happy sunny day! 1) Tribal relations have been great! I put it in God's hands and I feel like He's totally working. 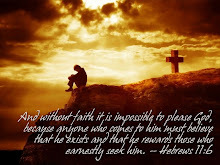 I need to continue to trust that God will work in the situation and that good will prevail. 2) Aiva made a teeny tiny book today in preschool - she was so proud of it. It just continued to remind me that my baby girl is not so teeny tiny anymore. 3) I told something to my mom that has been on my heart lately. It has to do with her mom and mending their relationship. I told her that even though we turn our backs on God sometimes he still keeps pursuing us. I think she needs to do the same with her mom. Even though her mom has hurt her so deeply I think my mom needs to continue to pursue her. I'm glad I had the chance to talk to my mom. 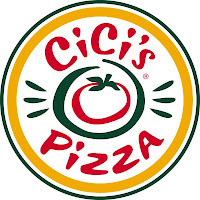 4) We went to CiCi's tonight and the way Ana says "CiCi's Pizza" just cracks me up! 5) Another laughable time was after Aiva got a necklace out of the machine at CiCi's that was a $ pendant. Nate told her that she could only wear it at home and she asked who wore these kind of necklaces outside of home and he told her "Druggies". She asked, "What's a druggie?" It was one of many questions that I'm sure we have to answer that we'll have to laugh at. Today is finally over the hump day! Yeah! It's one more reason to celebrate today! 1) When Aiva got to the office Monday, she went straight to Mrs. Lisa's office to check on the hamsters. It made me realize how fast she's growing up. She used to want me to go in with her. 2) For lunch Monday, I took Aiva home from preschool. We ate Subway and it made me realize that yes, my love language is quality time. No matter what we do, I love spending time with my family - even if it's only to "eat fresh"! 3) The weather has been awesome. Monday we went for a walk after work. I had a run in with someone and I just needed to talk with Nate. He always settles me down and reassures me. It was nice to be with him and just walk. 4) I got a lot done at work. Two of the guys have been gone which makes it quiet but I can really catch up on some things! I love catching up! 5) Biggest Loser ended last night! I love that show. Gave me just what I needed to kick off my week. I've been in a slump with my "diet" and it gave me a shove to keep working out...no matter how nice it is outside! OK...I keep up with a friend's blog and her recent post was about organizing...which I'm all about (when I can)! She gave a good website on organization. Click here to get to it. Today she talks about Menu Plan Monday which basically consists of planning your dinner schedule for the week. This not only gives you a plan for the week but saves you time and money too! Nate and I have gotten into the habit of eating out since it's so convienant...problem is that most of the time it's not the best food plus it can be expensive. I'm really going to try this and see if I can get it to work for us. Seems easy enough...check it out and see what you think. We just got back from Nashville and boy...is it good to be home! Here's to a new week. I pray it's a good one! 1) Boz and I went for a walk today. I wish it were longer but it was just the right temperature and the day was awesome. 2) Nate's fam had a great breakfast. The one thing we did well this weekend was eat good. Back to breakfast...the Panera bagels were TO DIE FOR! Maybe not that great but they were uummm good! 3) The girls slept just about the whole way home. We were blessed to not have much fighting on the way home. Ana is pretty vocal these days so it was a nice perk to the trip. 4) We got home at a decent time. I can't tell you how nice it is to get time when it's still light. Makes you feel like we didn't waste your whole day in a car...especially on Mother's Day! 5) When we got home, there were two Mother's Day cards sitting on the kitchen table waiting for me. It was a welcome sight since I thought Nate forgot about me today. They were really cute and made me cry...any card is a good card that makes me cry! Hope you mom's had a great day. God blessed us with a beautiful day! 1) I got to sleep in today until 8:15AM! That's 9:15 our time. If felt so great! 2) I got in a 4 1/2 mile walk today. It was so nice a peaceful. I heard the sound of rushing creeks the whole time. It sprinkled the whole time which felt nice in an off way! 3) Got to spend some time on Facebook today while Ana slept and Deb took Aiva to the bank. I feel like I never have the opportunity anymore to just surf through and really enjoy FB without feeling rushed. 4) We made fruit skewers for my father in laws birthday party - the strawberries where the best I've ever had. I'm not kidding. They had the best flavor. 5) The band Sullivan played at the party and it was so much fun to just sit back and here some oldies. One of the band members is friends with my sis in law so they put on a concert for the occasion. It was very relaxing to just sit back and listen. No place to be...no agenda. 1) Got to work on time yesterday...it's a miracle. I had the whole family with me and I was the first one there! 2) I got Aiva's present to me for Mother's Day. She made it on preschool and the number one thing she loves about me is that I make good broccoli! Second is that she likes my pretty dresses! 3) I got my emails sent out to a "certain" group to see if they can make a guest appearance at Step Into Africa. I hope it works! I'll be scoring major points if so! 4) On the way to Nashville, Aiva said,"dad can you turn off the AC so I can warm down?" It was so funny at the time...She meant warm up! 5) I got Chipotle for dinner...I haven't had that in FOREVER. It's been practically a year and I could probably blog just about that but I won't. I only do that for Mint Chocolate Chip Ice Cream! Africa meeting went great…overwhelming but GREAT! Gymnastics – Ana’s hair cracked me up. I’m tired of her hair being in her eyes so I gave her a Bam Bam due! Going to lunch with mom – we celebrated Mother’s day and I gave her the gift from the girls. Just made her day! End of the week – YEAH! Nate made an awesome dinner lat night – I love that man! Don’t you love it when someone says that we have to have a talk? All kind of alarms start going off inside of me and makes me all clammy and crazy inside. I HATE when people say this particular phrase to me! I worked for a doctor that loved to use this phrase quite often and needless to say he had nothing good to talk to me about when I entered his office. Even talking about it now makes me queasy! OK, so you’re probably wondering where I’m going with this. Here goes…last night I was at Kroger’s at 11:30PM browsing the card section when my phone rings. Now I know that I was there way too late and I knew that Nate was probably wondering where in the sam hill I was. It was Nate and he proceeded to tell me that I needed to come home and that I’d been at the store way to long. I told him that I would be on my way in a sec so go to bed and I’d be there soon. He then proceeded to tell me that when I get home we needed to have a talk. WAIT! You’re my husband! You know I hate when people say this! What are you thinking?!! So, at this point I’m getting all crazy and clammy and I go to check out and I’m feeling all scatterbrained. I finally get home and head to the bathroom…that’s right the bathroom. Even though it’s been minutes that I talked to Nate on the phone, it messed with my stomach enough to send me to the bathroom. I know probably too many details, but hey this is my blog! So, after a few minutes*, I step into the living room and said “Yes dear…you wanted to talk about something?” All he wanted to talk about was life…the normal on-goings of our life and that we’re kind of running in two different directions at times. It was basically a time to get refocused (sort of) and headed in the same directions. Ever feel like that? If you answer “no”, you’re not normal! Stop reading and go to another blog. Seriously though. We get so caught up with where we’re at or what we’re doing that we forget to stop and look to see where we’re at and who’s with us. I needed for Nate to tell me STOP! Hello…don’t forget about me! Ask yourself right here and now…do you need to stop to refocus….Catch a breath…Get a drink of water? Do it…you won’t regret the view! Promise! 1) Ana has been cuddly - take what I can get! 2) Aiva said "Mom you look pretty today!" 7) Last night the girls ate ALL of their dinner – it was something new so this is very rare! 9) One Tree Hill – Yeah…I’m addicted! 11) The weather has been amazing. 12) Went on a walk to UDF last night. I love being outside with family. Ask me again when it’s in the 90’s and I may say something different. 15) Nate did loads of laundry – it was great not to ask! 18) I’ve gotten to drive the red car two days in a row – Yeah! 19) Lost 2 pounds…keep it up Meg! 20) Biggest Loser is on tonight and I think I was the Biggest Loser today! I can hardly believe it's May. Where have the last 4 months gone. I think the older I get the faster it goes! The girls have been crawling the walls to get outside. Aiva got a new bike which she's so happy about. She wants to go bike riding everyday. I told her on Friday that I thought it was going to rain all weekend so no bike riding. I was quick to be proved wrong with yesterday's weather. We hung around the house in the AM. I got the girls registered for swimming and me for zumba. Nate made breakfast with what little pancake mix we had. We improvised with muffins in addition to pancakes. It was then that the afternoon took a turn. Ana had a fever all night which I tried to manage. We couldn't figure out why she was feverish until after brunch. She finally puked when she was down for her nap. The only bad part -other than that she puked - was that she was in our bed. Not so good! I had to make a run to the store for more detergent and some other "sick" stuff. 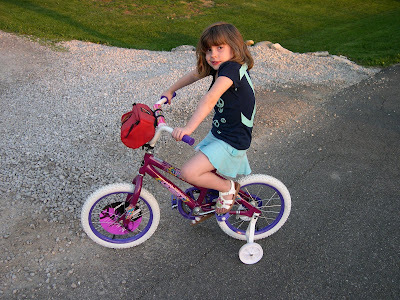 Once we got back I promised Aiva that since Ana was staying in that I would take her on a bike ride. We geared up and headed out. On the way back we stopped yet again at the store for dinner fixin's and a movie for the girls and Nate and I. Once we got back I started dinner and then got the girls ready for bed. Poor Ana couldn't decide if she wanted a bath or wanted out, wanted to potty or wanted off, wanted to throw up or back in the tub. We finally decided on out of the tub, in a diaper and off to bed. Nate and I finally finished the night watching NASCAR - I actually fell asleep! Anyway, so my point is...it's MAY and it's finally time to be outside! What are ya waiting for! Enjoy the May flowers! Thursday was a pretty good day...hope you're Thursday was a good one too! 1) My presentation at church went pretty well. I get to talk further at the next staff meeting. Hope it's taken with as much enthusiasm. 2) For lunch I went to the rec center and walked for an hour. It was good to get away and clear my brain...good prayer time as well. 3) After work, I went back to the rec center to wait on Nate and the girls to get there. We were going to work out together. I waited a half hour on Nate but it was so nice to just sit. Sometimes you forget what it feels like to just SIT and do nothing. 4) We left the phone and computer off last night. We just wanted to have a quiet night minus any ringing phones or temptations to check email. 5) Survivor! Actually I haven't gotten into it this time around. Just to watch something that Nate wanted to watch made me happy. I just got to relax and just be.